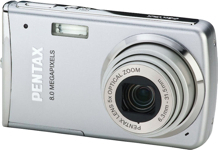 The Pentax Optio M50 (announced 23 January 2008) is an 8 megapixel point and shoot digital camera with a 2.5 inch LCD screen and 5x optical zoom lens (36mm – 180mm equivalent). The Optio M50 features face recognition technology (exposure and focus based), ‘auto picture’ mode which picks the best shooting mode for you, digital shake reduction and a variety of other shooting modes. It has 51 megabytes of internal memory and comes in silver, light blue and pink. With a high resolution of 8.0 effective megapixels and a high-performance PENTAX lens, the Optio M50 offers clear images. The PENTAX Optio M50 is equipped with a 5X optical zoom lens (angle of view equivalent to 36 to 180 mm lens in 35 mm format). A perfect zoom for portraits, landscapes, and other settings, the camera also features a digital zoom function (approx. 1X to 5.1X) for a maximum zoom equivalent to 25.5X. The Optio M50 will be available in the United States in a choice of three colors: silver, pink and blue. The Optio M50 features a large, 2.5 inch IPS LCD monitor with approximately 230,000 dots resolution for easy viewing of the screen during photography, playback and for easier camera operating and setting. With a wide viewing angle of approximately 170 degrees from all directions, the monitor also makes it easy to confirm images even from the side or when viewing images in a group. Featuring Face Recognition Auto Focus and Auto Exposure, the M50 can automatically detect and focus on up to 15 faces and set the optimum exposure. In addition, a Smile Capture function distinguishes smiles on a subject and automatically releases the shutter. Unique to PENTAX cameras, the Auto Picture mode allows the camera to automatically determine the shooting conditions and program settings for Landscape, Portrait, Night Scene, Normal, Flower and Sports mode. Digital Shake Reduction mode reduces camera shake and blur by adjusting sensitivity automatically to as high as ISO 6400 to match the brightness of the subjects. This feature allows photography at faster shutter speeds with less blur. This entry was posted in Digital Cameras, Pentax and tagged Pentax, Pentax Optio on March 23, 2008 by jonathanb.